Mechanic Narrabeen: GDL automotive services offers a free pick up service removing the need for a free loan car. Book your next service now with GDL automotive Services by clicking here. Most of this content is quoted from Raj Arjrt Of Predesigns Creator spaces. Don’t take me wrong. I am not saying a mechanic is less important than mechanical engineer. No! Both are important and have different place in society. A good mechanical engineer has much broader knowledge in variety of fields including automobile, power plants, machines, fluid, airplanes, structures electronics, instrumentation etc. They take consideration of designing from strength, economics, user experience, environmental hazards, safety and lot more. A mechanic, on the other hand, has much more specific knowledge, skill and importantly experience in his specific work. Mechanical engineers, study on working and designing of things. They do not practice “how to repair” things. It is agreeable, to think that if a person knows how a machine works and can design it, then he should also know how to repair it. But as and when the complexity increases (from small tools to say bicycle to two-wheeler to cars to airplanes to LHC), different divisions and specializations emerge and the different divisions become more and more prominent. As a simple example, you would have seen a bicycle user often repairing his vehicle himself. Ever seen a pilot repairing the airplane himself? The division becomes broader and broader. Given the poor standard of teaching in many colleges all over the world, many mechanical engineers don’t even know what happens inside the car, when the key is turned! – A bitter truth. 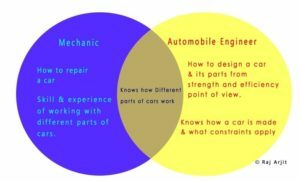 Similarly It is ridiculous to assume that a Mechanical Engineer has the knowledge level that exceeds that of a mechanic. These are different qualifications in a similar fled. Being a mechanical engineer gives one the theoretical understanding of how something works not how to repair it or its reliability.